Mike Ryan's homebred filly Positive Spirit defied her 11-1 odds on Saturday at Aqueduct, dominating the G2 Demoiselle by at 10 1/2 lengths in her fourth career start. The 2-year-old daughter of Pioneerof the Nile and half-sister to Kentucky Derby winner Always Dreaming was ridden by Manny Franco for young trainer Rodolphe Brisset, and covered nine furlongs over the fast main track in 1:56.01. 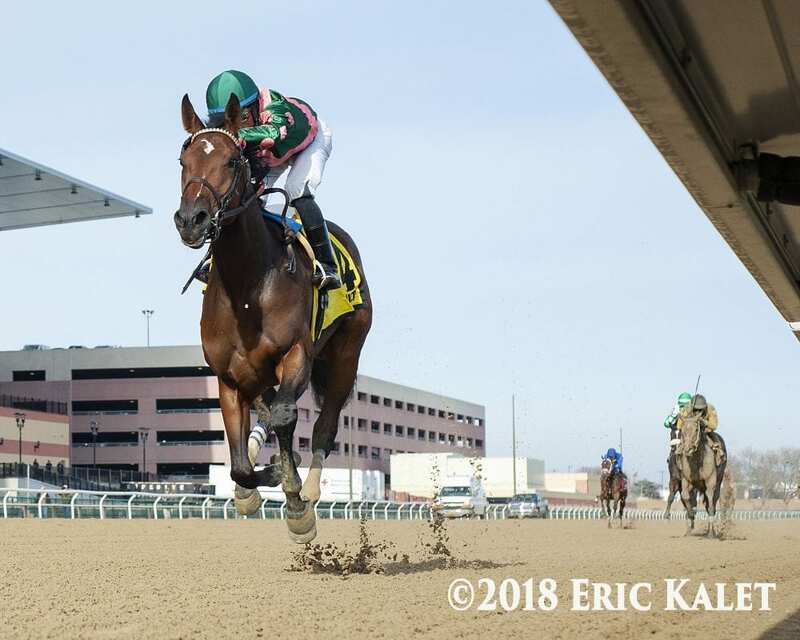 The Demoiselle winner earned 10 points on the Road to the 2019 Kentucky Oaks. Positive Spirit broke sharply from the center of the seven-filly field, but settled back just off the pace for Franco when both Enliven and 3-2 favorite Filly Joel came rushing up the inside. Filly Joel scored the rail position and set moderate fractions of :24.16 and :49.19, while Positive Spirit sat back in third, three paths off the rail down the backstretch. Entering the far turn, the three frontrunners drew even across the track as they began to wind up for the stretch run. Positive Spirit shook loose before the quarter pole, and turned for home a length ahead of Filly Joel. She was never challenged throughout the length of the stretch, and cruised under the wire an easy 10 1/2-length winner. Afleet Destiny came from last to collect second over Filly Joel. Bred in Kentucky by Ryan and long-time partner Gerry Dilger, Positive Spirit is out of Grade 3 winner and G1-placed Above Perfection, by In Excess. The filly has never finished worse than third, and now has two wins from four starts for earnings of over $200,000. “She really changed after the race in Keeneland [on October 6],” Brisset said. “The light bulb really went on after she got beat. I didn't want to cut her back to a mile [in a maiden-breaking win on November 8 at Churchill] but I didn't have any choice. We did that, and since, she's been training well and we took a shot here. She gave us all the good signs for bringing her and it paid off. This entry was posted in NL List, Racing, Videos and tagged Above Perfection, always dreaming, aqueduct, Demoiselle, Gerry Dilger, kentucky derby, kentucky oaks, manny franco, mike ryan, Pioneerof The Nile, positive spirit, rodolphe brisset by Paulick Report Staff. Bookmark the permalink.